Although the entire process took me a couple of hours, which would normally prove a test of my patience, I kicked back, enjoyed the radio and fully immersed myself in this recipe and concluded that the entire experience was actually quite therapeutic. This is also one of those bakes where you can, if you need to, busy yourself with other projects whilst the dough is proving. 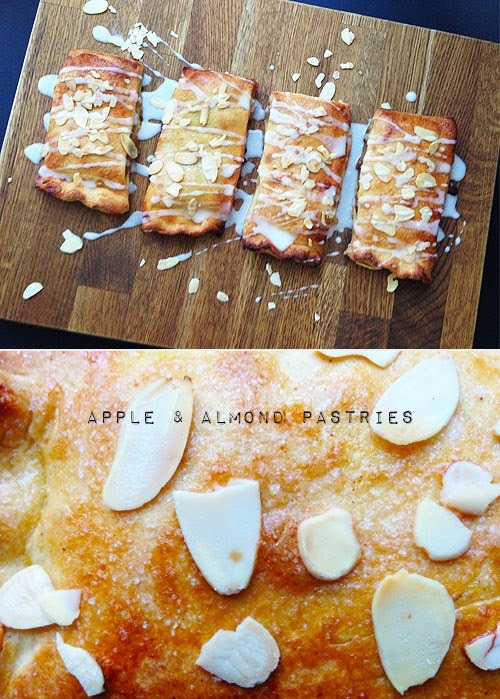 Best of all, having put in so much effort, I felt like I'd really earned a bite (or three) of one of the final pastries. 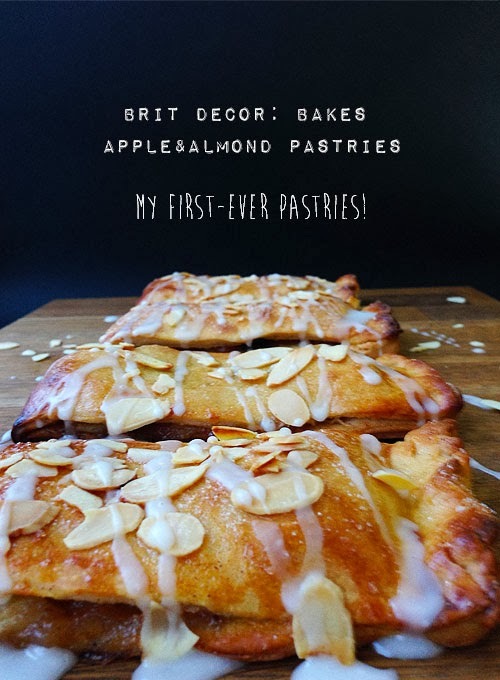 These certainly taste their best fresh from the oven with a cup of coffee. So come on friends, let's bake our way through 2014! 1. Heat the milk in a small pan, add the butter, sugar & salt and mix until fully dissolved. 2. In a separate bowl, dissolve the yeast in 80ml of warm water and leave to one side until the yeast has fully dissolved (approx 25 minutes). Then add the yeast water and one egg to the milky mixture in the pan. 3. In a large mixing bowl, place the flour and make a dip in the centre. Pour in the milky liquid and mix together until a firm dough is formed. Knead the dough on a lightly floured surface until it is smooth and even. Then place the dough back into the mixing bowl and seal with cling film. Leave in a dry, warm spot to rise for approx 1 hour. 4. Whilst the dough is rising/proving, go ahead and start making the filling. Peel, core and chop the apples, melt the butter in a pan and add the apples, raisins, sugar and cinnamon. Cook until very soft. In a jug, mix the cornflour with 50ml of water and add this to the cooked apples. Stir repeatedly until the mixture becomes thick. Remove from the heat and allow to cool. 5. Go back to your dough, which should have proved nicely and knead this gently before rolling out onto the floured surface again to make approximately a 25 x 46cm rectangle. Using a knife, cut the dough along the centre of the rectangle and then into 6 strips. 6. 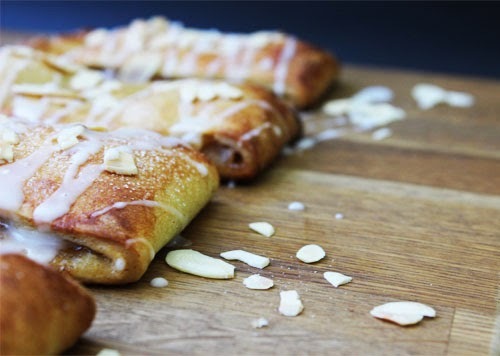 Place about 2-3 tablespoons of the cooled apple filling into the centre of each strip and fold the pastry over this. Lightly press down the edges and pinch the bottom ends together, creating indentations. Place the pastries onto the greased baking trays and cover with cling film for 20 mins (this allows the pastry to rise again). 7. Preheat the oven to 170 0c Gas mark 3. 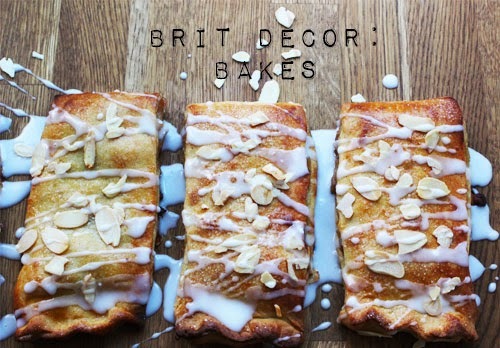 Lightly brush the pastries with the beaten egg mixture and sprinkle on top the flaked almonds and caster sugar. Bake for approximately 20 minutes. 8. Now time to glaze these crispy beauties! Mix the icing sugar with 3-4 tablespoons of water to create a runny mixture and drizzle over the pastries once they have cooled slightly.